String theory leads to some amazing (and controversial) implications. Although string theory is fascinating in its own right, what may prove to be even more intriguing are the possibilities that result from it. Parallel universes: Some interpretations of string theory predict that our universe is not the only one. In fact, in the most extreme versions of the theory, an infinite number of other universes exist, some of which contain exact duplicates of our own universe. As wild as this theory is, it’s predicted by current research studying the very nature of the cosmos itself. In fact, parallel universes aren’t just predicted by string theory — one view of quantum physics has suggested the theoretical existence of a certain type of parallel universe for more than half a century. 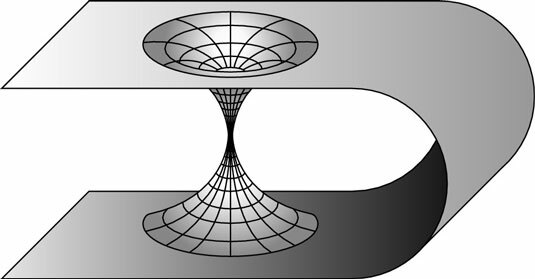 Wormholes: Einstein’s theory of relativity predicts warped space called a wormhole (also called an Einstein-Rosen bridge). In this case, two distant regions of space are connected by a shorter wormhole, which gives a shortcut between those two distant regions, as shown in this figure. String theory allows for the possibility that wormholes extend not only between distant regions of our own universe, but also between distant regions of parallel universes. Perhaps universes that have different physical laws could even be connected by wormholes. In fact, it’s not clear whether wormholes will exist within string theory at all. As a quantum gravity theory, it’s possible that the general relativity solutions that give rise to potential wormholes might go away. The universe as a hologram: In the mid-1990s, two physicists came up with an idea called the holographic principle. In this theory, if you have a volume of space, you can take all the information contained in that space and show that it corresponds to information “written” on the surface of the space. As odd as it seems, this holographic principle may be key in resolving a major mystery of black holes that has existed for more than 20 years! Many physicists believe that the holographic principle will be one of the fundamental physical principles that will allow insights into a greater understanding of string theory. String theory and time travel: Some physicists believe that string theory may allow for multiple dimensions of time (by no means the dominant view). As our understanding of time grows with string theory, it’s possible that scientists may discover new means of traveling through the time dimension or show that such theoretical possibilities are, in fact, impossible, as most physicists believe. String theory and the big bang: String theory is being applied to cosmology, which means that it may give us insights into the formation of the universe. The exact implications are still being explored, but some believe that string theory supports the current cosmological model of inflation, while others believe it allows for entirely universal creation scenarios. Inflation theory predicts that, very shortly after the original big bang, the universe began to undergo a period of rapid, exponential inflation. This theory, which applies principles of particle physics to the early universe as a whole, is seen by many as the only way to explain some properties of the early universe. In string theory, there also exists a possible alternate model to our current big bang model in which two branes collided together and our universe is the result. In this model, called the ekpyrotic universe, the universe goes through cycles of creation and destruction, over and over. The end of the universe: The ultimate fate of the universe is a question that physics has long explored, and a final version of string theory may help us ultimately determine the matter density and cosmological constant of the universe. By determining these values, cosmologists will be able to determine whether our universe will ultimately contract in upon itself, ending in a big crunch — and perhaps start all over again.